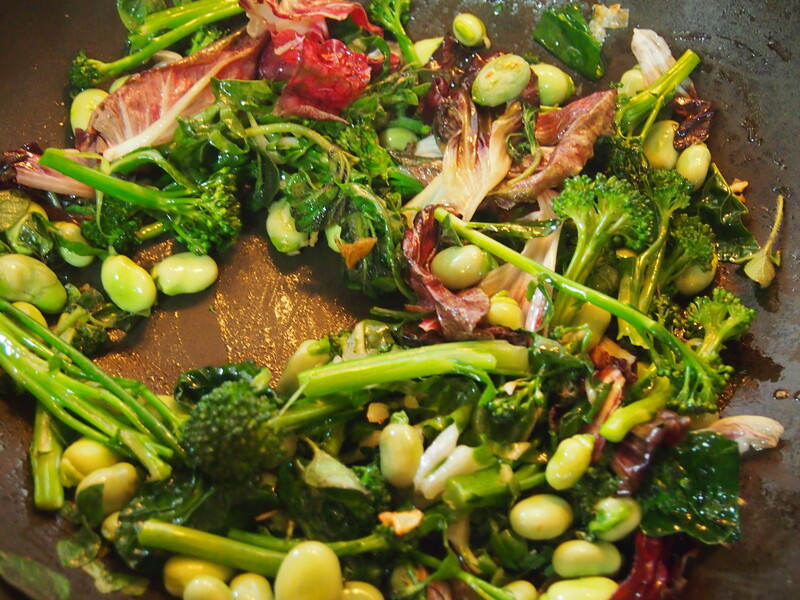 Broad beans ( Fave) are often associated with poverty and simple, peasant eating. 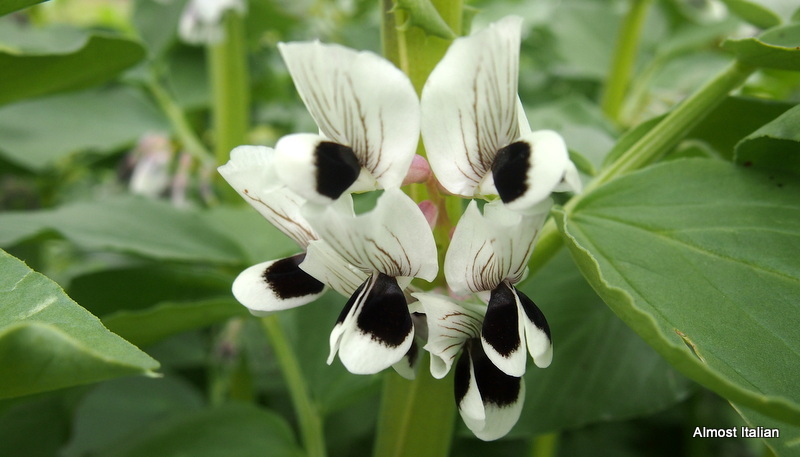 They grow prolifically and produce a bounty of fresh beans, with plenty to stash in the freezer or dry. 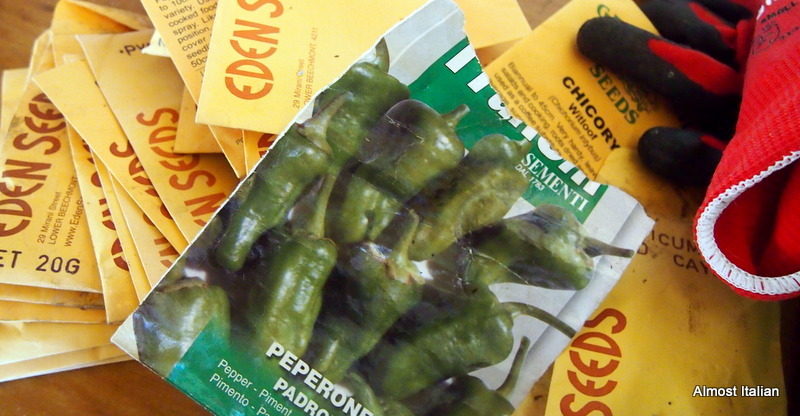 The Italians who migrated to Australia in the 1950s and 60s, with “Courage in their Cases,” also had a few dried fave beans sown into the lining, a memento of home and a good luck seed. 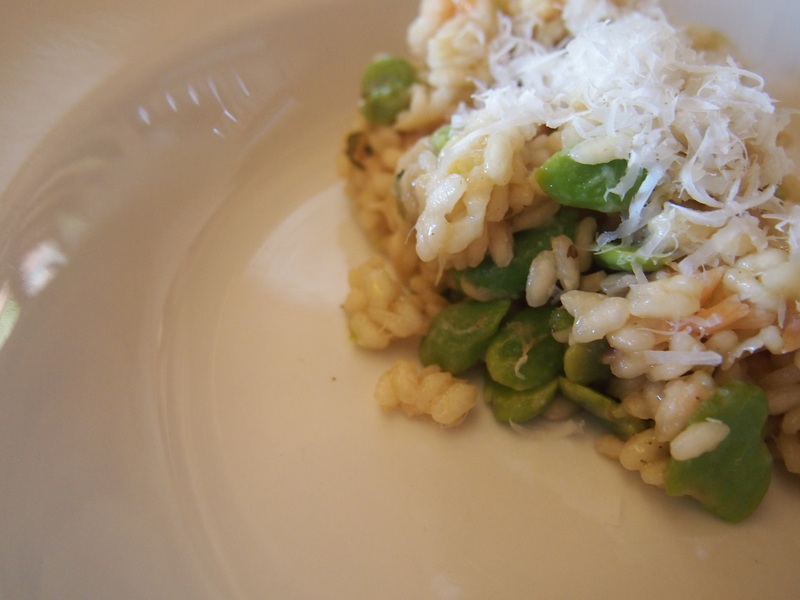 When married with quality risotto rice such as Vialone Nano or Carnaroli rice, as well as a small slab of hot smoked salmon or trout, the humble broad bean enters the realms of rich man’s food, la cucina borghese. 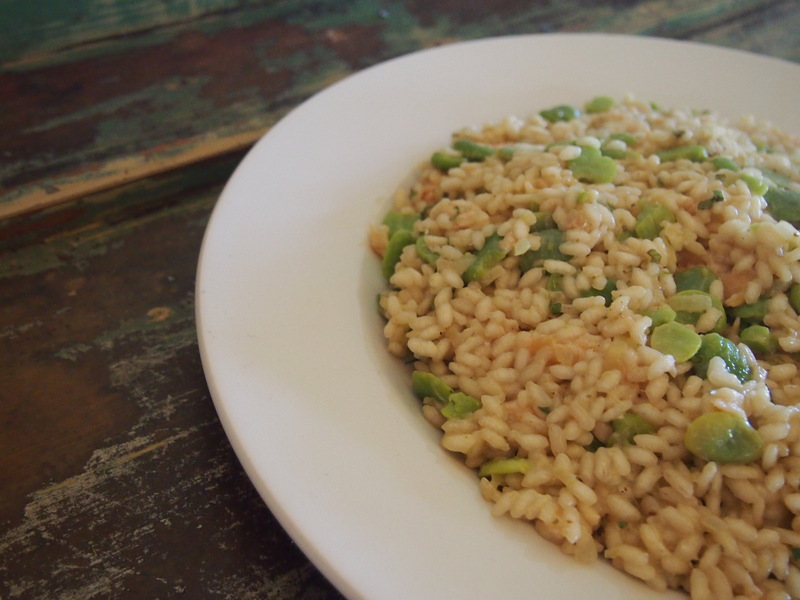 You decide: keep it cheap and leave out the hot smoked fish and use a cheaper everyday arborio rice, or lash out! Grana Padano or Reggiano Parmigiano, grated, a generous amount. 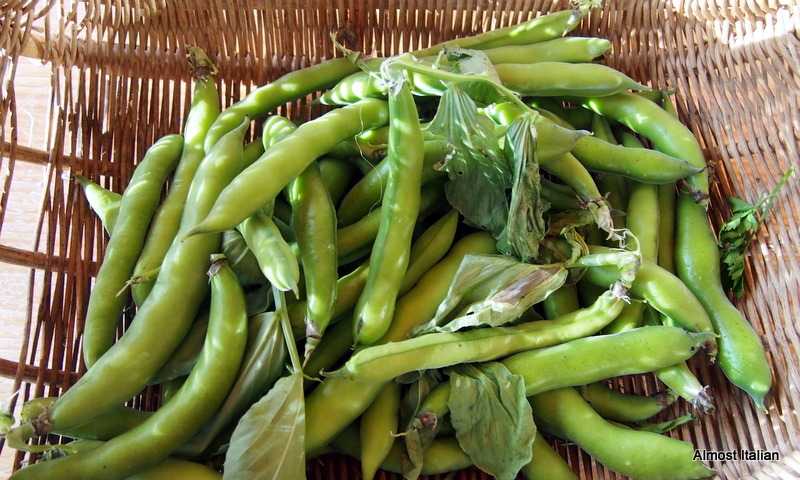 Firstly, boil the shelled broad beans for 3 minutes, drain, then peel by simply squeezing the outer shell, and sliding out the tender, bright green inner bean. Even better, get some little person to help. 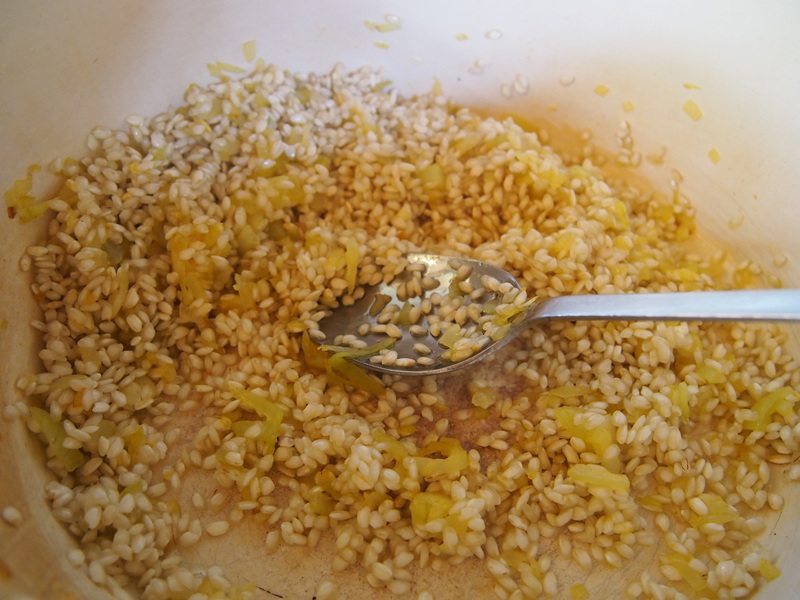 Heat 20 gr of butter and the olive oil in a heavy base pot, add the chopped onion and cook on low until the onion has softened and is golden in colour. Add the rice and stir about until the rice becomes covered and opaque. Turn up the heat to medium. Add the wine, and stir until it bubbles away. Then add a ladle full of stock, stirring as you go, until the liquid has been absorbed. Continue in this way until all the stock has been used, around 20 minutes or so. In the last few minutes of this process, just as you add your last stock, add the beans and stir through. First stage of cooking risotto. Gently stir through the salmon and the chopped herbs, then fare il mantecare. This is an essential step to add creaminess and finish to the risotto. Add the remaining knob of butter and a generous amount of grated parmesan ( 1/2 cup) to the rice, stir through to ‘cream’ the rice, then cover the pot, off the heat, and leave for a couple of minutes. Serve on a large round or oval platter, with more parmesan, and serve from the outside, in a circular fashion, which maintains the heat in the centre. 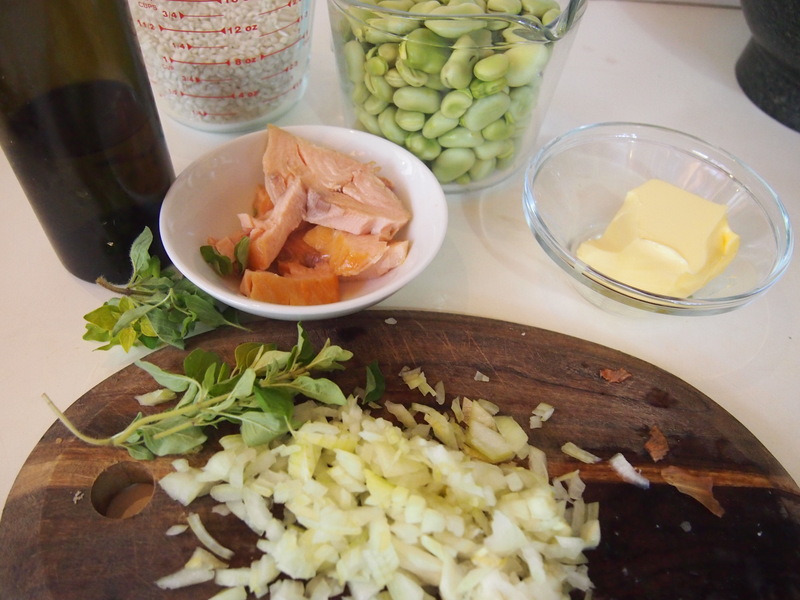 Find other seasonal broadbean recipes from my previous posts using these links: Tagliatelle with Broadbeans and Smoked Salmon and Rice, Farro and Barley Pilaf with Broadbeans. 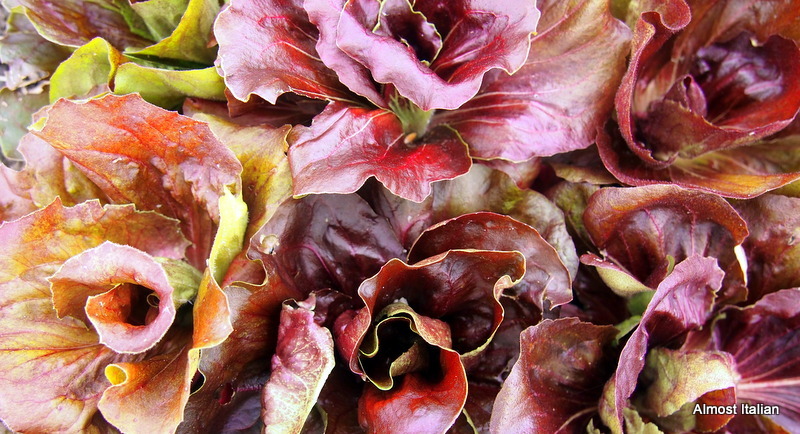 Spring on a Plate. Cucina Povera. Cucina Povera is my kind of cooking. Historically, as the name suggests, it is the cuisine of the poor, or rather that of the Italian contadini or peasant class, those who relied on their own home grown seasonal produce and preserves stored in the dispensa, but not much else. It also suggests eating what’s on hand- what is available or in season. 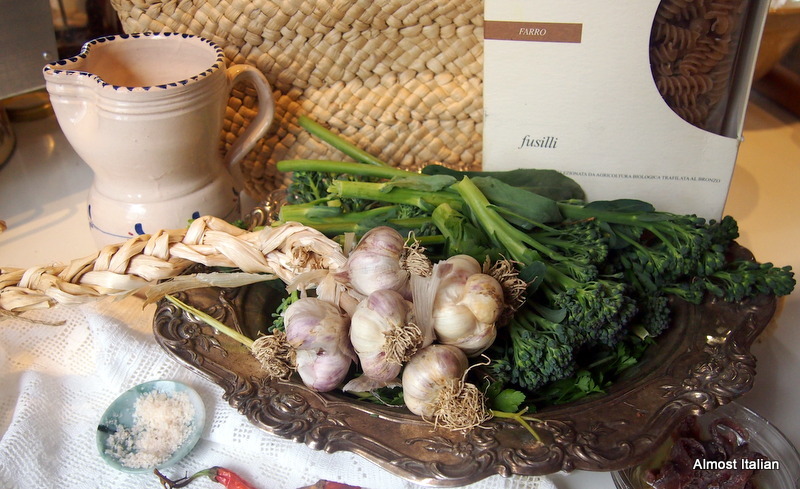 As Italy is now a very urban society, this style of cooking can be seen, historically, as rural cooking. 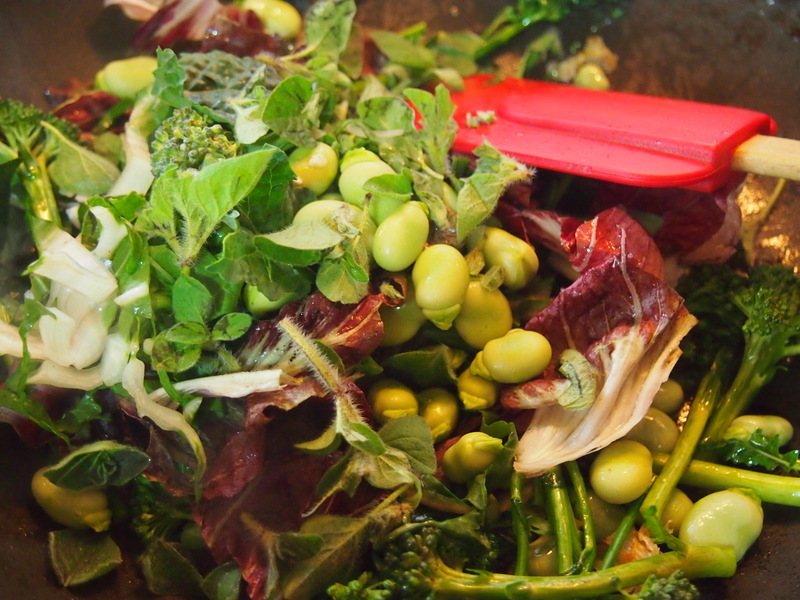 It becomes cuisine of the wealthy when many different fresh herbs and vegetables are purchased from farmers’ markets to produce a simple Pasta Primavera. The garden is your best friend: grow food among your flowers, in your front yard, on your balcony, on the nature strip, in containers. 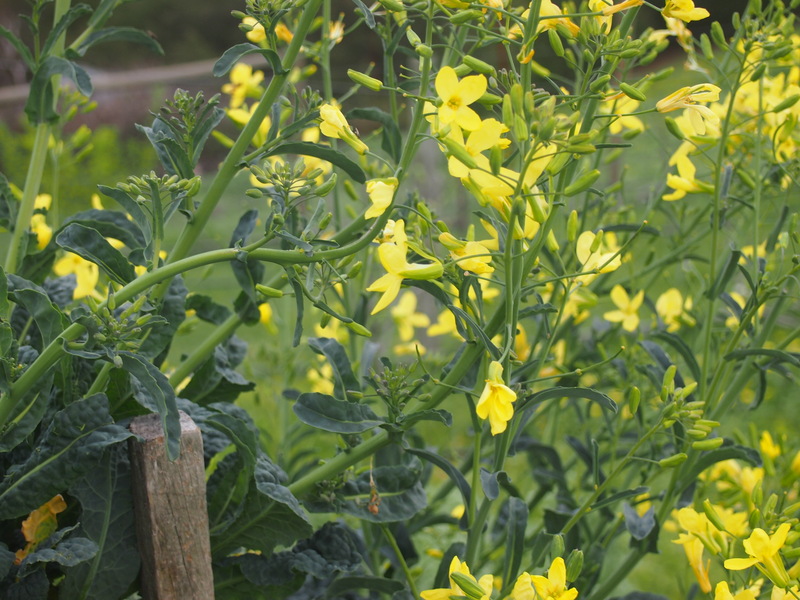 Many tasty and nutritious pasta dishes can be thrown together with a handful of wild rocket, herbs or silverbeet (chard). These things grow like weeds. Along with a few staples from the pantry, such as rice, pasta, lentils and dried beans, anchovies and EV olive oil, cucina povera is a few short steps away. This week’s pasta ingredients are shown in the photo below. It assumes you have stashed a few little luxuries in the pantry, such as some very good extra virgin olive oil, and a chunk of parmigiano Grano Padano or Reggiano. The other little splurge for today’s pasta recipe is a box of Farro pasta, in this case by Monograno Felicetti. I picked this up at the Mediterranean Wholesalers in Brunswick, and I must say here, that I receive no kickbacks from either of these companies. Substitute any short pasta you have on hand. 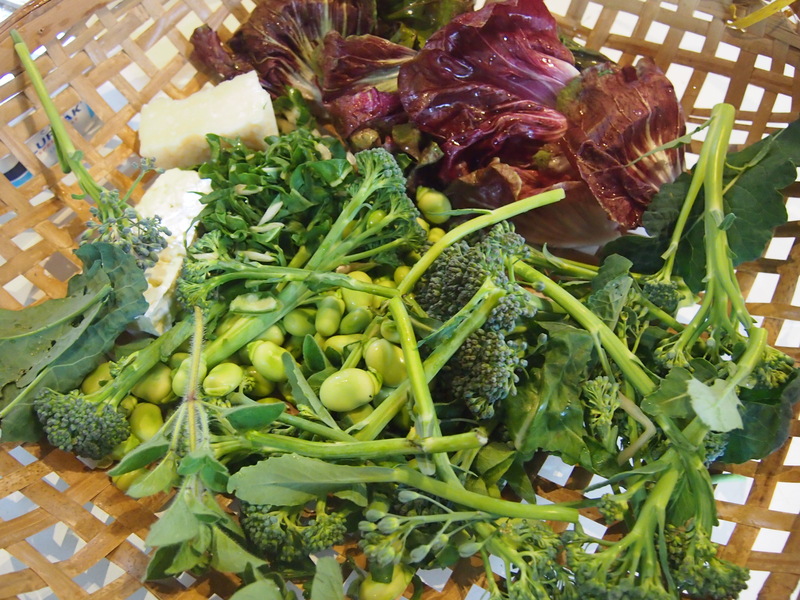 I picked some lovely leggy broccoli shoots, a small radicchio, young broad beans/fave, a few baby kale leaves, some fresh oregano and a big silverbeet/chard leaf. Some of the greens were shredded, hand torn or plucked. 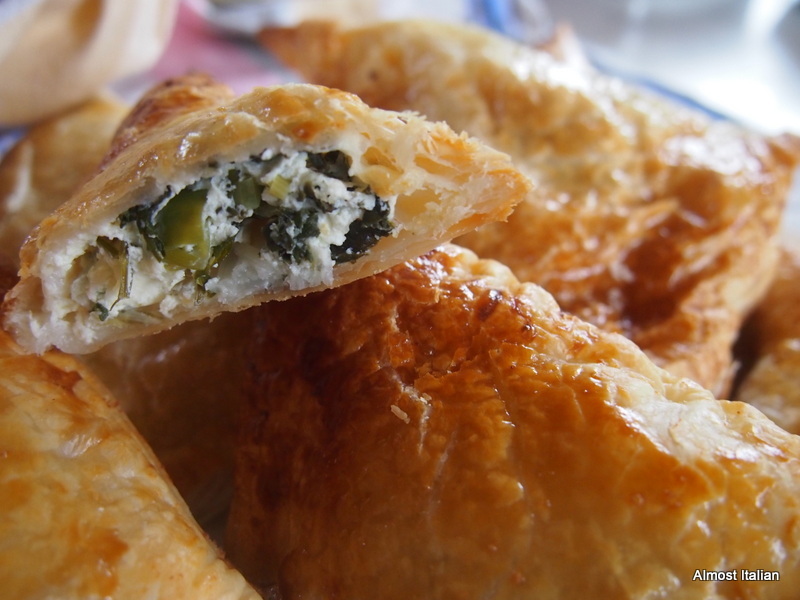 The picture also shows two small chunks of cheese- fetta and parmigiana. Some goats cheese, or tiny nuggets of gorgonzola, would make a good substitute. Again, use what cheese you have. Not shown, but always assumed, are a few cloves of garlic, smashed up, salt, and olive oil. I often melt a few anchovy fillets for flavour, but not this time- I wanted a pure Spring taste. Into a big open pan goes a generous glug of oil and a few cloves of smashed garlic. After a quick stir on medium heat, in go the garden pickings. Meanwhile, or even before one plays with the garden greens, a big stockpot of boiling salted water is on the go, then Butta La Pasta, throw in the pasta. I count on 100 grs per adult if the dish is un piatto unico, a one course dish. 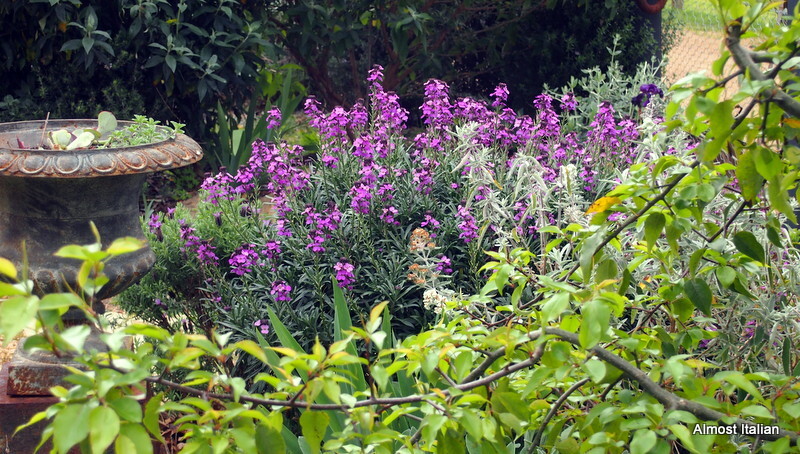 Within no time, the leaves wilt and the baby broad beans soften. Time for some salt and a few grinds of pepper. 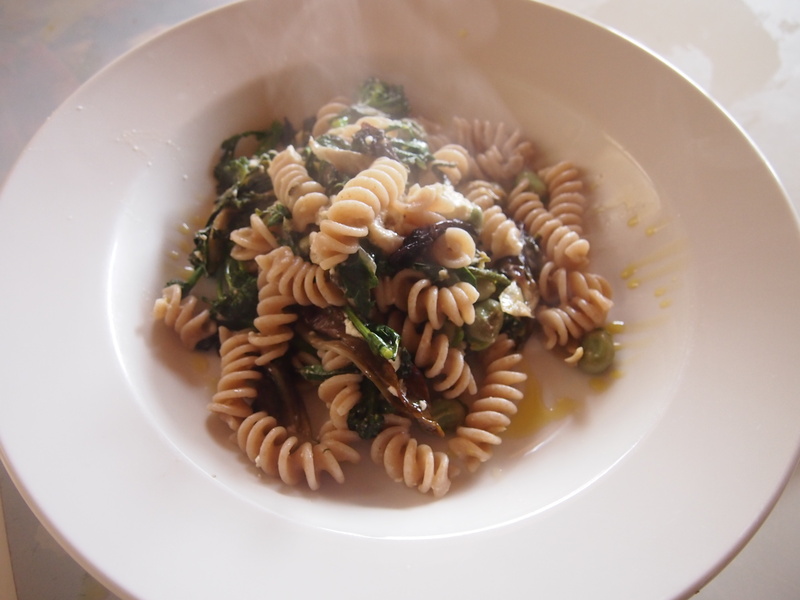 When the farro spirali pasta is ready, scoop out a little pasta water before draining. Add the drained pasta to the cooked vegetables and consider whether to add a few tablespoons of the reserved cooking water to loosen the dish, making a garlicky unctuous sauce. Increase the heat and briefly toss again. Add lots of ground pepper then crumbled fetta. 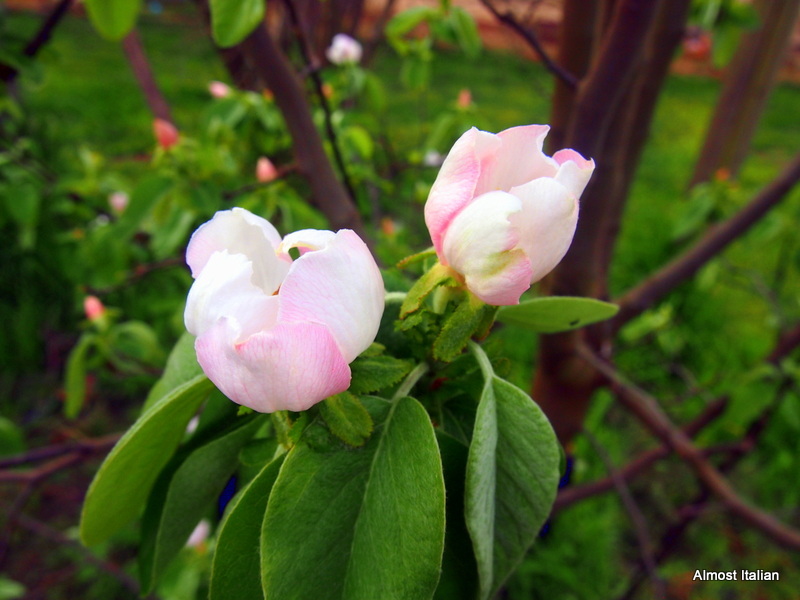 Feel the creative energy of Spring. Then plate. Serve with a golden lick of good olive oil and some grated parmesan. 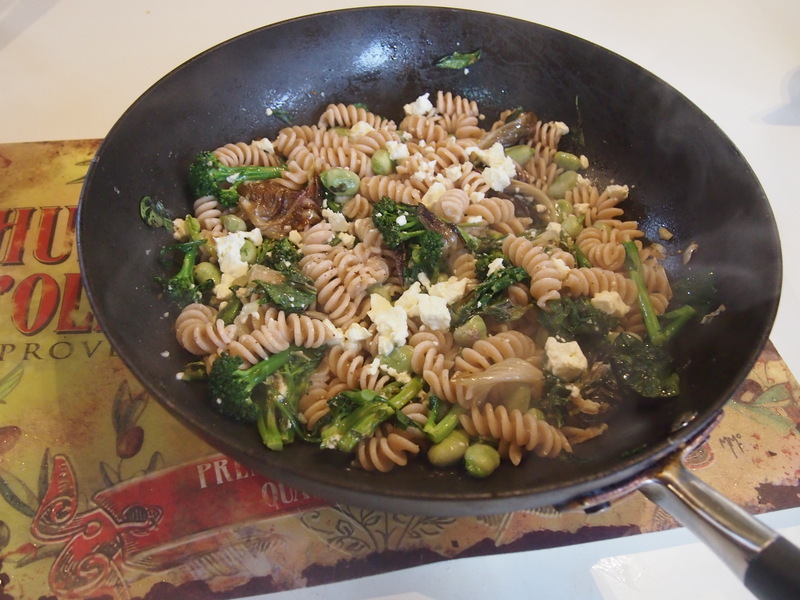 Posted on October 12, 2014 October 16, 2014 Author FrancescaCategories Budget, RecipesTags brocolli, Brunswick 3056, farro, fave, fetta cheese, garlic, gluten free, parmigiano, pasta, primavera, radicchio, recipe, the Mediterranean wholesalers, Vegetarian36 Comments on Spring on a Plate. Cucina Povera.